I’d been thinking about writing this post last week, before the news of Charlotte Dawson’s death. In some ways the post is now even more relevant, but at the same time it’s become far more complex, trying to separate the one small point I was going to make away from the myriad issues of celebrity, depression, cyber-bullying and more. My initial post was triggered by a poll I saw on nzherald.co.nz. It seemed innocuous enough at first, it seemed to blend with the other ‘Entertainment’ stories on the page. But as I read, re-read, and re-considered it, the more I kept coming back to one conclusion: That’s Fucked. If you need me to join the dots for you on this one, then sure: You’ve got three people who have jobs at a company. They’ve only just started those jobs for the year, two of them have only been in the position less than a month. The show’s had some issues – this re-jig is seen as a bit of a fresh start, and everyone’s putting their best foot forward. Despite what might be seen as a cack-handed publicity effort, willfully misinterpreted by a gossip columnist as a sign of imminent blood-letting, there is no suggestion any of the three jobs is for the chop, other than the sense any primetime employment is tenuous at best. But again, two of the hosts had only just been employed, and if they’d wanted to get rid of the third they’d had the perfect opportunity at the end of last year. Let’s be clear. There’s no reason to suspect one of the three has to go. So why have a poll, asking the public which of these human beings they’d “like” to be fired? Oh, you know, shits ‘n’ giggles. Some clicks. The general enjoyment of reducing someone’s livelihood to a reality-show-style public elimination round. If it were anyone other than presenters whose jobs were being voted on, I think there’d be outrage. 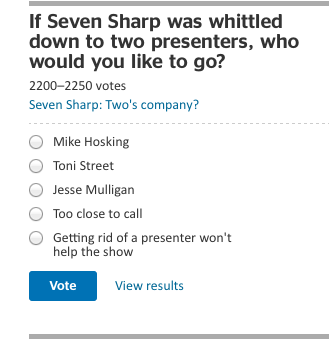 If there was another round of job cuts at APN, and TVNZ ran a poll of which Herald journalists should get fired, that’d be pretty awful. If Vodafone did the same thing about Telecom employees, disgusting. I’d tweeted my thoughts on this poll last week, and pointed it out again in response to a conversation being had this morning on Breakfast in which TVNZ staff read out some of the worst tweets they’ve received. Hideous stuff. Am I trying to silence media criticism as someone suggested? No. But I don’t consider the repugnant example above fits that category. I mean, you don’t have to be Arthur Nielsen to realise its more skewed than one of Colin Craig’s polls. Let’s say, just say, that you like all three presenters, or God forbid, you actually like the show. How do you reflect that in the available answers? You can’t, and so the show is either being let down by one of the three; all three; or doomed regardless. You’re smart people, you get what I’m saying. The feedback I received from my last post was interesting. A lot of those inside the media read it as saying people outside should be nicer. Those outside, the opposite. What I had intended was a little from column A, a little from column B, a bit of holding hands and singing Kumbaya. Some got that. But Charlotte also faced attacks from the media. It’s interesting that most of the coverage I’ve seen has focused on cyber-bullying, conveniently saving the media from gazing inward. Any journalist now recounting stories of abusive tweets should take a moment to consider whether they’ve ever published a story that’s caused unnecessary hurt – and by “necessary” I don’t mean because it’s a “good yarn” or guaranteed ratings-winner. The same doesn’t have to apply to news and current affairs programmes. If I say “I don’t like 3 News”** do you automatically assume it’s the presenters I hate, or the reporters, the editors, the camera operators? No. It’s possible to dislike the show without disliking anyone on it. Unless you make it personal. Unless you run a poll. Then it’s personal. Then people get hurt. *I don’t hate The Ridges. The Ridges I could take or leave. **I don’t dislike 3 News. It was an example.